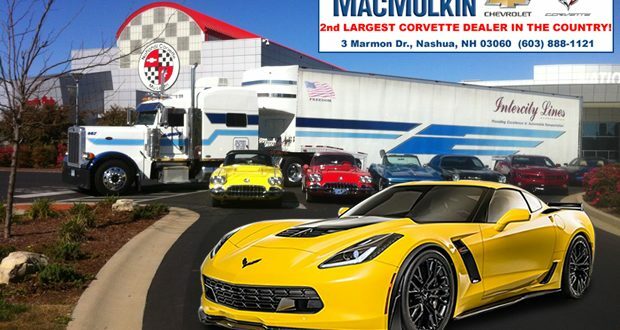 Let MacMulkin Corvette Arrange Your Corvette Shipment - MacMulkin Corvette - 2nd Largest Corvette Dealer in the World! Our first response is usually that we have some of, if not THE best pricing in the country and NO DEALER DOC FEES, but that isn’t the whole story. If you place an order for your Corvette through us, our team will work with you to arrange a Courtesy Delivery to a local Chevrolet dealer near you, or include the National Corvette Museum Delivery Experience as part of your order. If you choose to do a Courtesy Delivery, we will arrange to have your new Corvette shipped from the Bowling Green Assembly Plant to a local Chevrolet dealership of your choosing. Most dealerships charge a small fee ranging from $150 – $750 to do a Courtesy Delivery. That dealership will be responsible for accepting your new Corvette from the factory, conducting the Pre-Delivery Inspection (PDI) and introducing your new Corvette to you. The Courtesy Delivery fee is paid to that dealership and not MacMulkin Corvette. If you choose to take delivery of your new Corvette at the National Corvette Museum, we encourage you to check out some of the Museum’s various Delivery Programs. If you choose to purchase one of our in-stock Corvettes, we can facilitate shipping to you anywhere in the continental United States via fully enclosed trailers by one of the industry’s top shipping companies! Check out our Corvette specials before time runs out on 1-16-2017! Next: Limited Time Offer: Best Corvette Pricing in the Country!